Ahhhh, to sleep like a baby! Everyone loves a good night’s sleep but not everyone understands all that happens inside the human body when it sleeps. Much more than rest and a reset, sleep helps the body perform many functions that are essential to life. Each night when we sleep, our bodies perform a full body tune-up. Ideally, humans should get 7 – 8 hours of sleep per night. That allows the body to do all the things it needs to reset for another full day’s activity. Sleep helps your mind as well as your body. Have you ever heard the expression; “sleep on it”? People say this whenever they are facing a troubling issue and there is a reason for it. We learn hundreds of pieces of information during our daily routines and when we sleep at night our brains sort through the information and help us make sense of it. During sleep, our brain decides which pieces of information are important enough to keep and which will fall to the waysides of our memories. Sleep also brightens our outlook on the world and helps us combat stress. Studies have shown those who sleep the recommended amount of time show fewer depression symptoms. Sleep is a trigger to your brain to release hormones that promote the growth of tissue. You can see evidence of this when you get in a big work out and your muscles are sore the next morning. Ample sleep also helps the immune system. White blood cells accumulate during sleep that the body uses to fight bacteria and viruses. Studies have shown those who get 7 or more hours of sleep have fewer colds per year than others. Despite its importance, millions of people have trouble sleeping in the United States. There are many prescription medicines that induce sleep for those with sleep issues but many prefer to use natural methods. Using natural remedies limits the intake of chemicals into the body and reduces the chances of negative effects such as dependence or addiction. A topical essential oil blend, ZEN SUBLIME SLEEP, can also be applied to the back of your neck, wrists and feet at night + inhale it. Include the lavender in the diffuser if you have a bad case of insomnia. 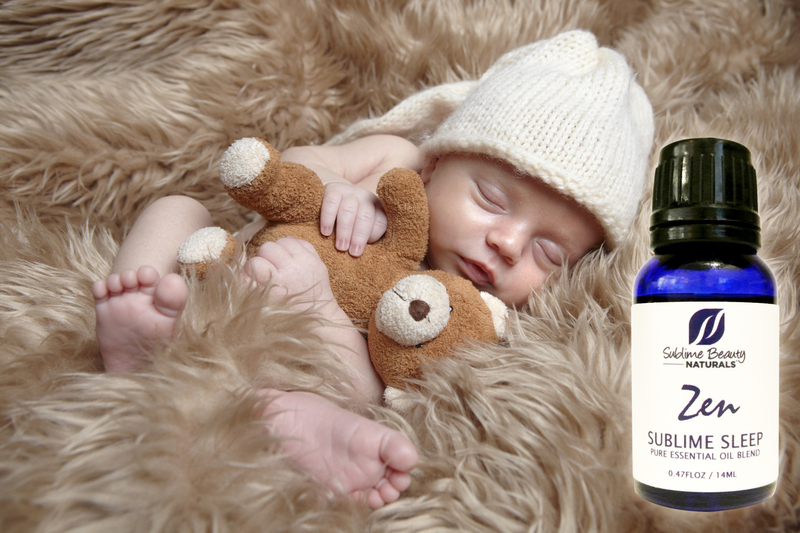 Lavender – well known and most used essential oil for sleep assistance. Lavender calms, soothes and nurtures. It helps to balance the spirit, and reduces any existing anxiety. It also helps reduce pains which may hinder sleep. Rose Geranium – fosters a sense of security and protects from disturbing energy or thoughts. Orange – unblocks energy; found in clinical tests to be a sedative that calms, pushes down pessimism and is a tonic for mind and body. Neroli – relaxes nerves, soothes the heart and psyche, and helps relieve pain. Clary Sage – well-known to reduce anxiety and stress. It works synergistically with lavender for sedation and calming effect. An additional aid is meditation. Turn your mental focus completely on the act of breathing and nothing more. (We like to do it with light soothing music.) It takes practice. Intentionally relaxing and meditating can make falling asleep easier especially when combined with relaxing essential oils. 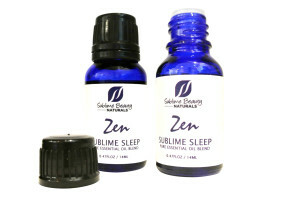 Pick up Zen Sublime Sleep and Lavender Essential Oil on the Sublime Naturals webstore or on Amazon.